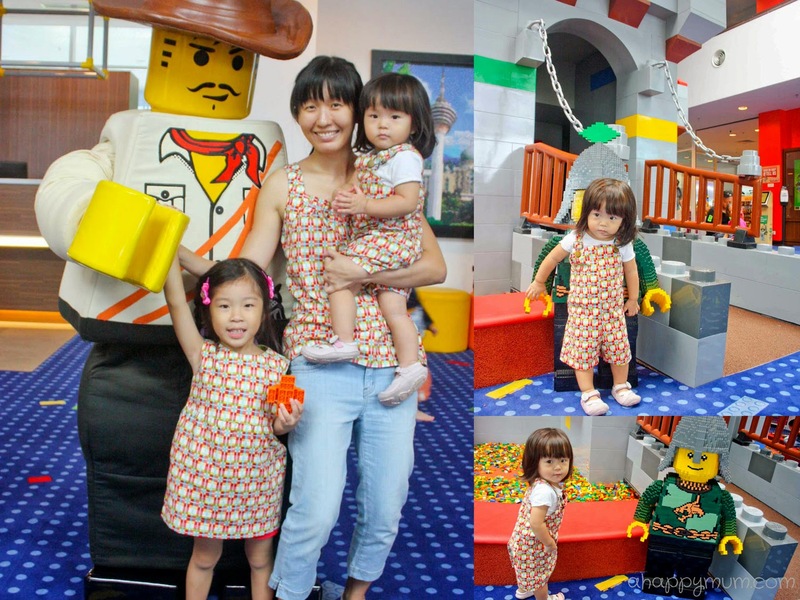 Remember our first trip to LEGOLAND Hotel in Malaysia last year? That was during the media preview and we brought my mum as the hubby was out of town. Since then, this conversation had been taking place at home every once in a while. Angel: You know, Daddy hasn't been to LEGOLAND Hotel with us. Me: Yes dear, that is because he was not free to go with us. But don't you remember we visited the original LEGOLAND in Denmark and stayed in the Hotel and the Village? Angel: *tries hard to recall but likely can't* Okay. But we can still bring him to the one in Malaysia, right? Me: Alright. Maybe when your birthday nears, we can arrange something. I promise. Well, it turned out that November seemed too far away and her puppy eyes were too hard to reject. So, for my birthday in April, yes it was my birthday, the hubby managed to take leave at the last minute and so we decided to make a spontaneous trip to LEGOLAND Hotel for a 3D2N stay. After all, if everything is awesome for the kids, everything is awesome for me, right? I remember the last time we were here, Ariel was less than a year old and had not taken her first steps. 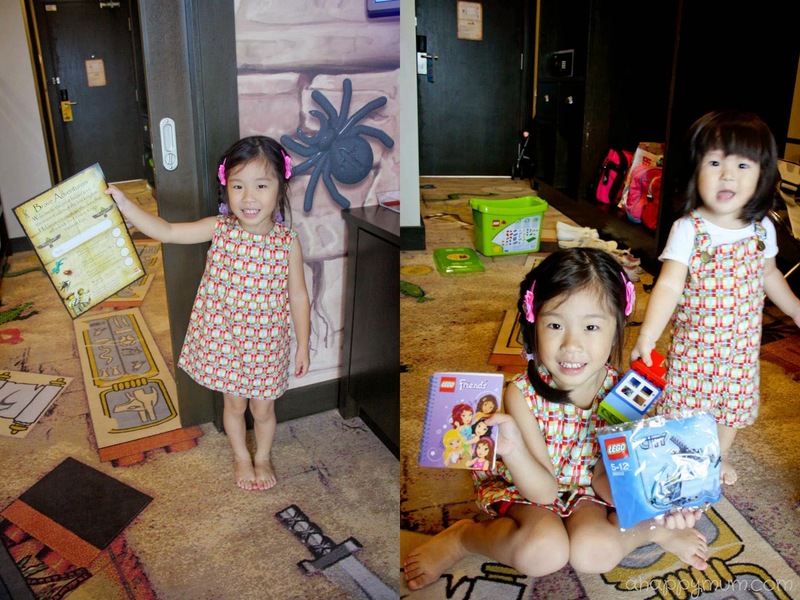 This time round, she was all set to explore the place and even dived straight into the pools of LEGO found at the lobby. Even before we checked in, I knew that it was a great decision to come here because the kids were simply going to have a blast. 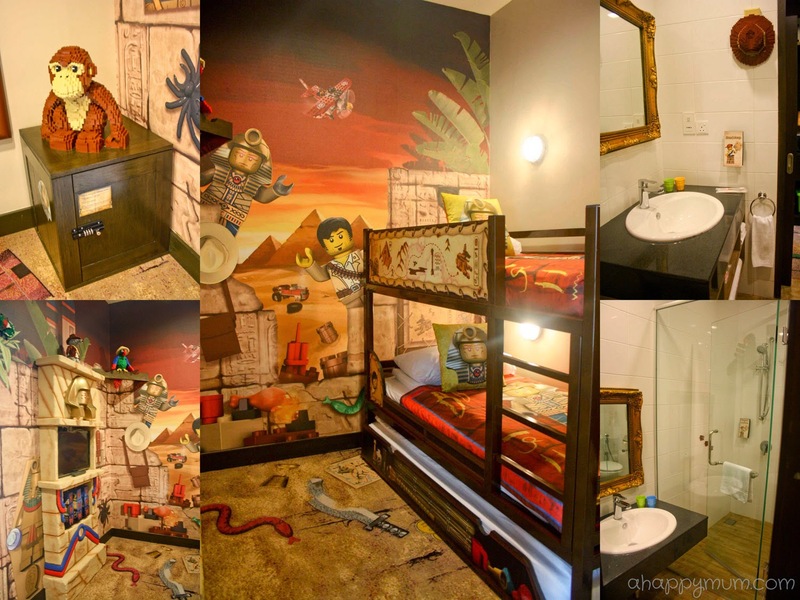 Since we stayed in the Pirate room previously, we requested for a different themed room this time round and guess what we got - an ADVENTURE room with Egyptian mummies, pharaohs, scorpions, lizards and tarantulas. Beautiful, right? The moment the hubby stepped in, he was like "Woah!" and was impressed by both the decoration and size of the room. I still love the fact that there are two separate sleeping areas where parents get to sleep on a king-sized bed while kids can camp at the bunk beds - each area comes with a TV. It doesn't matter that eventually both the kids slept with me on the big bed while the hubby slept on the bunk bed after happily watching his football game, I still love and appreciate the thoughtful design of the room. I mentioned before about the treasure chest found in every room that comes with a surprise gift, right? Well, it sure helped to keep the kids entertained for a little while as they tried to solve the clues and open it. This time, Angel was a pro at it and she was delighted to find not only a pack of LEGO, but a LEGO Friends sticker book too. As for Ariel, she was contented to just play with the LEGO Duplo set in the room. Once we were settled into our room, it was time to head out for food! 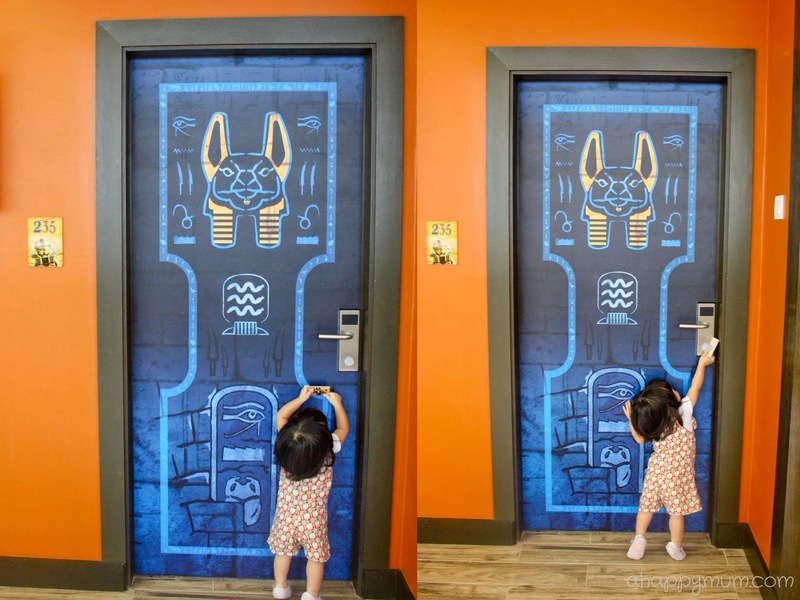 It isn't often that kids get reluctant to leave a hotel room but LEGOLAND Hotel has that somewhat magical power on almost every kid. Even though we kept hearing this tune when we went into the elevator, all of us, I do mean from the young to the old, just couldn't help moving to the beat whenever the disco music and bright lights came on. 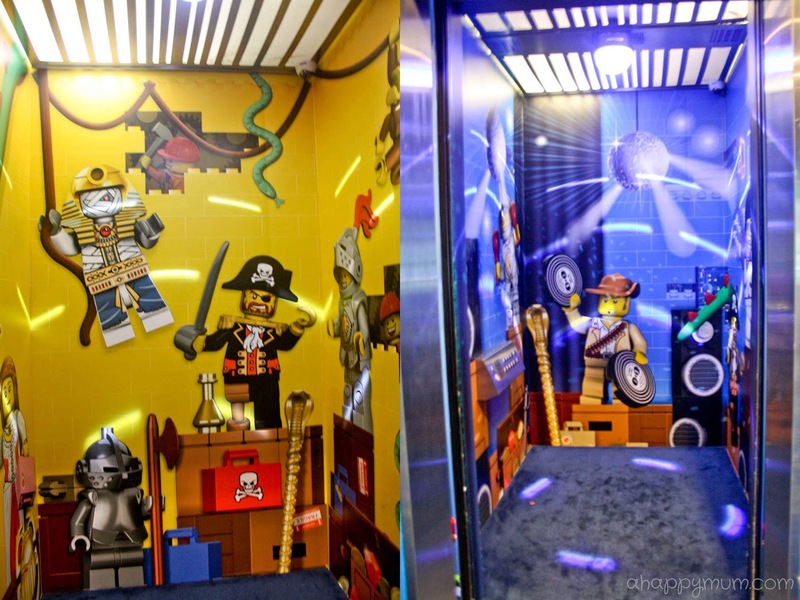 I have to say this has got to be my favourite elevator of all time! It was the first time we had lunch at Bricks Family Restaurant since we normally only have breakfast there and would be out for the rest of the day. I loved how the kids were kept occupied with colouring sets while we took our time to explore the menu. Check out what we ordered! We were pleasantly surprised by the generous portions, especially the seafood - the prawns were humongous and the crabs were yummy! In fact, we came to a consensus that it was all quite value for money and we wouldn't mind dining here more often. 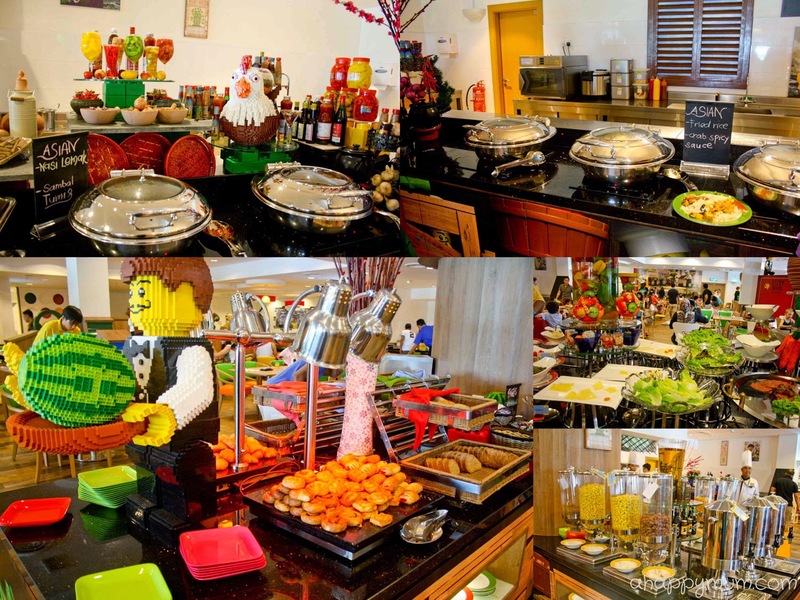 Do remember to show your LEGOLAND membership card when you eat within LEGOLAND premises, including hotel and parks, because it entitles you to discounts. 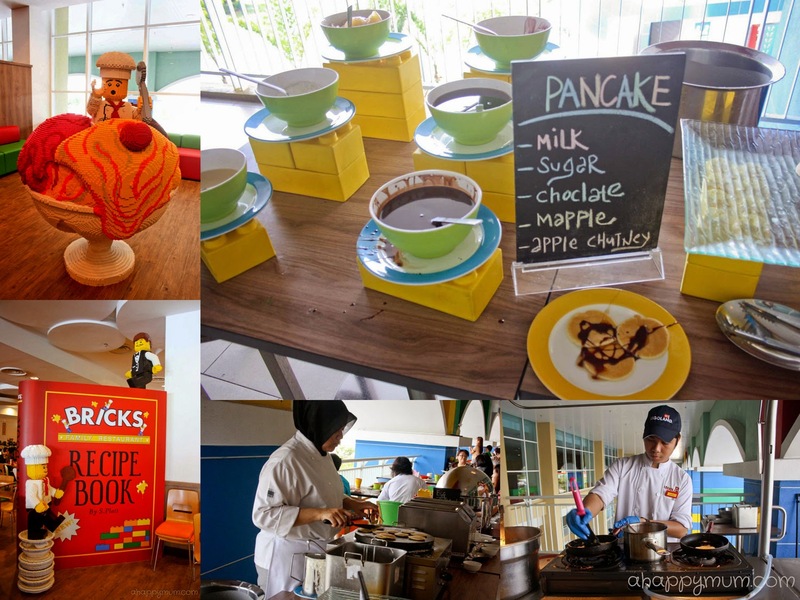 For breakfast, we were satisfied with the variety of food offered, from cereal, pancakes, pastry, salads to omelettes, nasi lemak, prawn noodle soup and more Asian delights. There was also porridge available for the little ones with a range of condiments to choose from. It was also a thrill for the kids to be able to come up close with the LEGO mascots - why, we even met Emmet and Wyldstyle from the LEGO movie, much to Angel's excitement. As for Ariel, she was happy to give them hugs and high fives. We also noticed that she took a keen interest in the LEGO figurines around the hotel and would walk up to every one of them to look at their faces, stroke them, talk to them and even strike poses with them. Cute. When the kids were not in bed and in the mood for play, we were more than happy to let them have fun at the soft play area and build LEGO models with the over 1,000 bricks found outside Bricks Restaurant. Remember there was a Xbox Kinect station at the lobby for all guests to have fun? Previously, we only played once mainly because it was a rafting game that only allowed one player and Angel did not show any sign of interest in it. This time round, it was totally different. Even though the game could only sense up to four players, you could see a dozen adults and kids showcasing their dance moves as they grooved to the beat with Just Dance Kids. The music videos were appealing, the music was catchy and the dancing was inviting. So yes, we joined in a handful of the dance sessions! Sometimes, it was left with just the four of us but we kept going simply because it was so much fun. Actually, the hubby and I continued to dance even when the kids were beside us playing with the bricks. Well, no more clubbing days but perhaps this could be a start to healthy, family dance sessions? Here, this is a video we took for keepsake but promise me you won't laugh too much at our ridiculous moves. On the night when we counted down to my birthday, the hotel staff was so sweet as to provide a complimentary tiramisu cake. We were initially a tad disappointed when they informed us that they had run out of candles because that meant that the kids would not get to enjoy their favourite part of blowing out the candles. After a couple of phone calls to check with the staff on the nearest convenient store so that the hubby could run out, they told us to wait for a little while and soon enough, one of the staff appeared at the doorway with three newly bought candles. Was I touched? Very. A big thank you to the manager on duty and to the staff who made my wish, and the kids', come true that night. Did the girls get any presents from the trip? Why, yes. One got a LEGO Duplo Toddler Build And Boat Fun while the other got a LEGO Disney Princess Rapunzel's Tower. Lucky kids, right? Yes, we couldn't help it but spoil the kids on holidays like this. Did I get any present that night? Well, big hugs, kisses and "I love you, Mummy", I think these were priceless. Not to mention the bag of precious memories I got to bring home after the trip. Soon, it was time to bid farewell once again after what I would say was one of the most awesome family getaways ever. 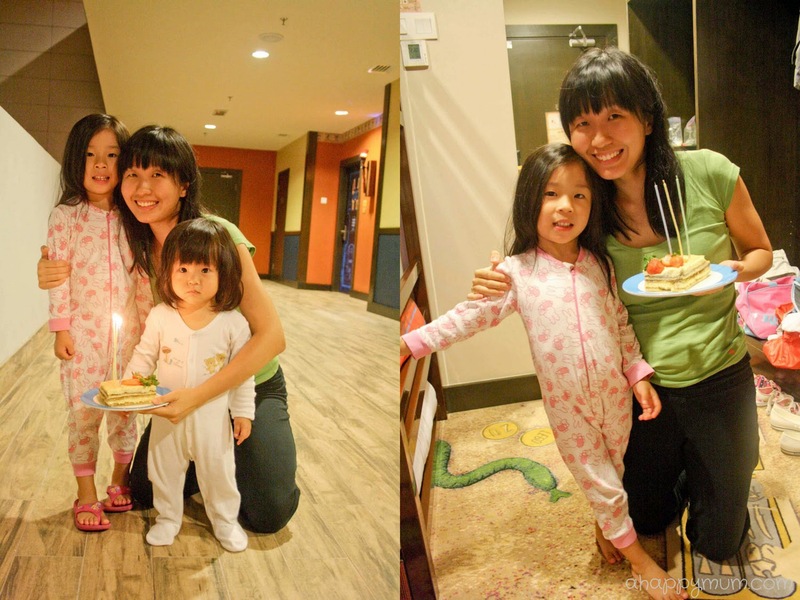 I spent my 29th birthday in LEGOLAND Billund as a family of three and my 31st in LEGOLAND Malaysia as a family of four. I can't think of any way life can get better for me and I am deeply thankful for having this lovely family that constantly surrounds me with joy and love. Thank you, LEGOLAND Hotel for all the great hosting, generosity and awesomeness you have shown us and I hope we will be back again soon! P.S. Stay tuned for more write-ups and pictures as I share with you our adventures at the LEGOLAND theme park and the Water park. 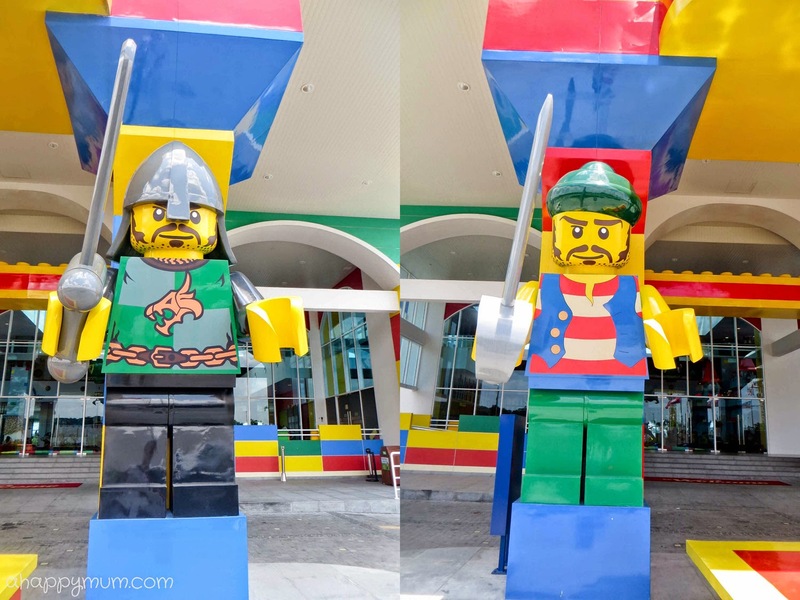 LEGOLAND Malaysia Resort brings together a LEGOLAND Park, Water Park and Hotel in one LEGO themed location. It is a family holiday destination with more than 70 hands-on rides, slides, shows and attractions. For more information, visit www.legoland.com.my. Disclosure: We were sponsored one night's stay at LEGOLAND Hotel, Malaysia and paid for the extra night ourselves. One-day park admission tickets were also received but guess what, we already own the annual passes because we just love this place too much! I LOVE this post sooooo much!!!!! This will definitely be one of the places we stay at when we next visit Asia! Thanks Mags! Yeah I think you should definitely consider visiting Legoland! :) let me lnow if you hop by Singapore! :) thanks for reading! Summer, I am inspired and encouraged by your family holidays. They certainly plant many seeds in my mind with the possibilities to be had with mine. Thanks again for posting informative and practical experiences!!!! I LOVE THEM!!!! Guess what - I am one of those who have yet to stay there! Ki love how bright and happy the rooms are but think my kids will have a hard time falling asleep cos all they'll want to do is play play play! We might book a stay some times. That longing look in their eyes, it just kills us doesn't it? Haha suckers we are!